Chris Rennaker and Katy Steinmetz lead the charge through Ashland’s Lithia Park during the Wednesday night Rogue Valley Runner’s group trail run. Photo by Jared Cruce. Go if You’re equally fanatic about trail running and the Bard. Ashland has hosted the Oregon Shakespeare Festival from February to November every year since 1935. Located just 15 miles north of the California border, Ashland is nestled in the foothills of the Cascade and Siskiyou mountains. After running the area’s ponderosa pine-sheltered trails, head to the open-air Elizabethan stage to take in a Shakespearean play. Or, for drama-free relaxation, go soak in Lithia Springs’ famous mineral waters. Race … March’s Tar and Trail 6-miler (roguevalleyrunners.blogspot.com/2008/02/tar-n-trail-6-mile-race.html) goes on- and off-road, including singletrack and wood-chipped trails. Log some miles on the Pacific Crest Trail with the Siskiyou Out Back 50K and 15K (siskiyououtback.com), starting and ending at the Mount Ashland ski lodge. Or dash 5600 feet to the top of Mount Ashland in August’s 13.3-mile Mount Ashland Hillclimb Run (mtashlandrun.com). 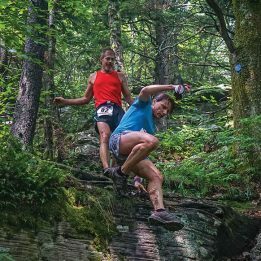 The first annual Lithia Loop Trail Marathon will be held this year on November 8, along Ashland Creek and the trails and fire roads winding through Rogue Valley National Forest. 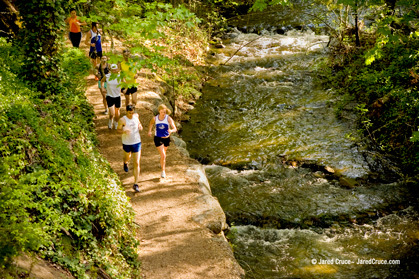 Best trails … For an 11-plus-mile jaunt, run right from the center of town in Lithia Park and follow the Creek-to-Crest route to the foothills of Mount Ashland, at 7500 feet, the highest peak in the Siskiyou Mountains. There, get on the Pacific Crest Trail, which winds its way from Canada to Mexico. 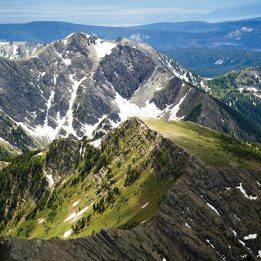 Run through mountain meadows of wildflowers and deep coniferous forests on what the PCT Association calls the “easiest” section of the 2650-mile trail, because of its easy footing and gentle elevation changes. Or, stay closer to town and head south along Ashland Creek to hook up with a variety of loop trails. For the inside scoop on lesser-known trails, show up at Hal Koerner’s Rogue Valley Runners shop on Wednesday evenings for four- to eight-mile group runs, with frequent appearances by world-class runners. 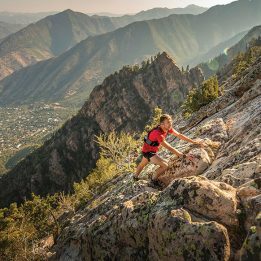 Go when … “August through October is the best time to run,” says resident and 2007 Western States 100-miler winner Hal Koerner. “Temperatures are cool, and there’s a lot of blue sky.” Enjoy daylight late into the evening, little precipitation and bug-free forests as you run through the Rogue Valley’s wilderness. Trails are accessible year-round, if you can handle the heat or the rain, as steep trails provide good drainage and little mud even in the rainy season. Best eats … Enjoy some great local brews on tap, like Caldera’s crisp Ashland Amber, at Siskiyou Micro Pub (ior.com/siskiyou). Find your morning buzz at Evo’s Java House (evoscoffee.com) with their organic coffee and vegan breakfast treats. Pitstop … Rogue Valley Runners (roguevalleyrunners.com) is committed to outfitting and fostering Ashland’s trail-running community. Owner Hal Koerner moved to Ashland in 2006 and opened the store, staffing it with an impressive lineup of runners. Sleep … Camp at Siskiyou National Forest or travel 1.5 miles to Jackson Well Springs (jacksonwellsprings.com), where you’ll find hot springs, massage therapy and mineral baths. In the town center, check out the recently restored historic and elegant Ashland Springs Hotel (ashlandspringshotel.com), with rooms from $129. Resources … The Chamber of Commerce (ashlandchamber.com) has info on restaurants, hotels and the Shakespeare Festival. Download printable trail maps from the Ashland Woodland and Trails Association (ashlandtrails.org).